Think about anything you consider yourself an "expert" in - a skill related to your profession, a hobby, a category of trivia or knowledge. How did you become an "expert?" You probably have a certain acumen for learning new things related to your area of expertise, but ultimately, it came down to a decision you made at some point to seek and find knowledge about a topic. And then to do it again and again and again. Talent is something you are more or less born with. Expertise is nurtured, coddled, and deliberately tended to so it will grow. You may have few talents, but anyone can develop expertise. 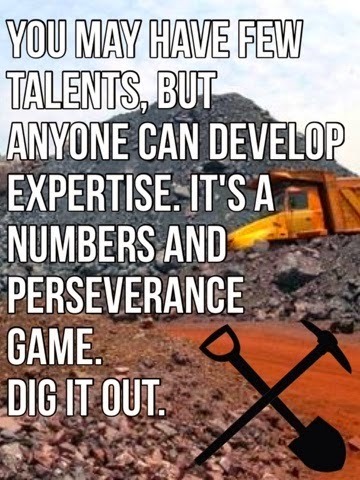 It's a numbers and perseverance game. That said, my district is in up to our knees in a software transition for every major information system we use. Every employee in the district is in effect relearning how to do their job this semester. Through a little bit of formal professional development and a whole lot more informal and self-directed, I've become the go-to guy for SIS tutorials, questions, and gripes. The switch is affecting our students and families, too, because we don't have their access to online grades and attendance unlocked yet, so the school newspaper is working on a piece about it. I was approached by a student-reporter today for some quotes about SIS. STARGAZER: If you know, why was there a change from Edline to Tyler? CHUCK BAKER: The way that SIS can manage and integrate the data we generate in our gradebooks and attendance with your student records is a leap from Edline. Our attendance software was from the 80s, our gradebook from the 90s... Data is KING in the 21st century, and SIS is going to make how we manage, manipulate and analyze our student data much easier. SG: How will the affect students and their ability to view their grades easily like they did with Edline, and will students be able to access grades on Tyler like they did with Edline -- if yes, when? CB: Right now, teachers must give students and parents print-outs or post grades on the wall of the classroom, which is what a teacher with more than 6 or 7 years of experience used to have to do anyway because it was the ONLY option. You know how things are a little bit sucky when an app is in beta? We're in beta with our SIS implementation still.The plan according to the district technology department is to open the student/parent portal (your side or SIS) for 2nd semester, but there's a chance it could be sooner. Some elementary teachers were using NO form of electronic gradebook, so putting everything into SIS is a HUGE leap for them. We have to wait until the majority of teachers in the whole district have the gradebook figured out. SG: Will there be any long-lasting affect of this switch during the current school year, if yes what will they be? CB: I don't think you'll notice any long-lasting effects of this switch during the current year from the your teachers. The grade level offices are able to check attendance and discipline much quicker now, so they might be able to be more proactive in addressing patterns of absence or behavior before they are too late to fix. I think we might see more differences next year, when much more of the staff is very comfortable with the system. SG: Have students complained to you about their inability to easily view their grades? CB: My AP Stats students (my seniors) complained on like, the 2nd day of school, but my other students have been cool with the printouts I've been giving them. From my experience, giving students a piece of paper is sometimes more effective in focusing their attention away from the Snaps and notifications bombarding their devices. I find it in myself, too. I often will open my laptop or grab my iPad to do some actual work, but I get lost in social media or crushin' candy - if I need to leave the distraction of iPad, I do the work on paper first. SG: What will be noticeably different from Edline? CB: My favorite noticeable difference for students and parents to look forward to once your side of SIS is unlocked is that there will be much more information available to you in once place. Besides just grades, attendance will also be readily accessible, and teachers will be able to post any extra directions or links to web and/or multimedia content for a lesson right on the listing on the grade report. You would not have to specially ask for such and such handout that you need to complete missing or make-up work, or to find the link to your math teacher's video lesson. SG: If you could chose a few of the positive affects of implementing this system, what would they be? The negatives? The parent/student side of SIS looks more user-friendly than the reports Edline gave you, and I like the idea of being able to provide lesson resources right there instead of uploading them to a different site that you have to access separately. Our various data sources integrate more easily - student attendance or behavior patterns can be caught, monitored, and addressed before they become larger problems. CHANGE. A lot of people really hate change, man.